Follow-ups can be difficult in college football. Backing up a big victory with another one the next week is usually the sign of a true championship contender. A few ranked teams and playoff hopefuls will be trying to do just that Saturday. No. 6 Michigan visits rival No. 24 Michigan State after walloping Wisconsin in a national televised home game. No. 12 Oregon, which beat rival Washington at home in overtime last week, goes on the road to No. 25 Washington State. Cougars fans figure to be pumped with ESPN’s “College GameDay” making its first visit to Pullman. No. 5 LSU gets the benefit of playing at home and at night against No. 23 Mississippi State to follow-up its victory against Georgia last week. Five more things to know about week eight of the college football season. No. 16 North Carolina State at No. 3 Clemson. The road to a fourth straight Atlantic Coast Conference championship does not appear to be particularly treacherous for Clemson. N.C. State is the only other ranked team in the conference right now and it could stay that way for a while. The Wolfpack present a real threat, though. The last two meetings have been one-score games, including an overtime escape in Death Valley for Clemson in 2016. Wolfpack quarterback Ryan Finley is an NFL prospect and he’s playing behind one of the few offensive lines in the ACC that have a shot to match up with Clemson’s loaded defensive line, led by midseason All-American Clelin Ferrell. 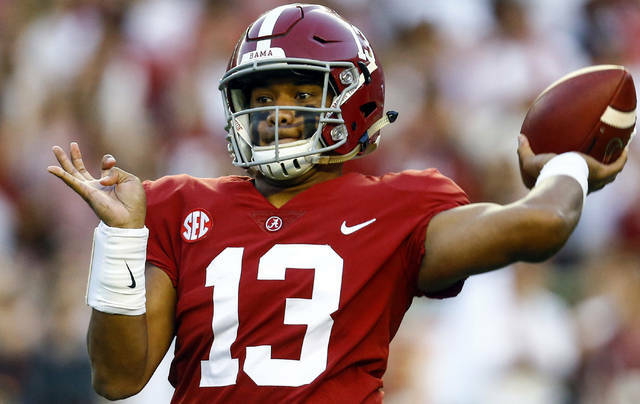 The front-runners have clearly been established in the Heisman race, but the question now is who else can emerge with a late rush? 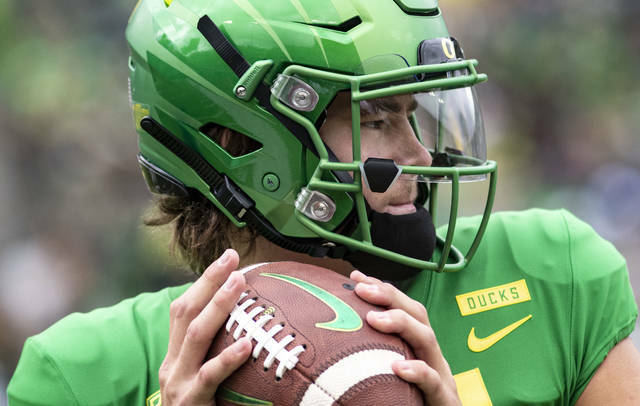 How about Oregon quarterback Justin Herbert? 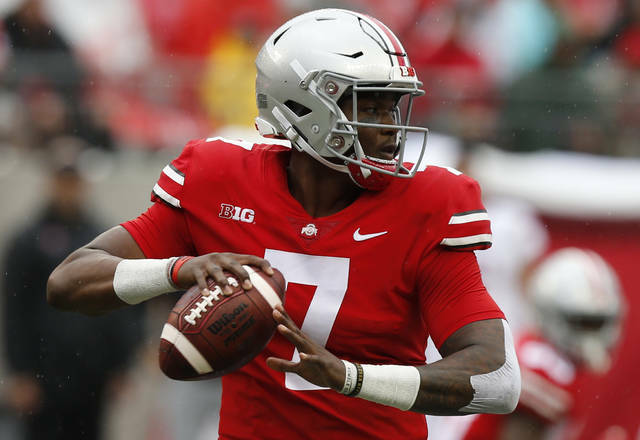 His overall numbers are lagging behind the likes of Tua Tagovailoa and Dwayne Haskins, but he has time to make up some ground and a second straight nationally televised game to get voter’s attention. It doesn’t hurt that Herbert might be the best NFL prospect among quarterbacks who could be available in 2019. The junior faces a Washington State defense that is tops in the Pac-12 against the pass, but one that has fattened up on some poor passing teams. 11 — No. 1 Alabama’s winning streak against Tennessee. The Crimson Tide is favored by four touchdowns to make it 12 straight against the Vols, now coached by former Alabama defensive coordinator Jeremy Pruitt. 17 — Consecutive true road games No. 9 Oklahoma has won, heading into its game at TCU. 19 — No. 10 Central Florida’s winning streak, heading into its game at East Carolina. UCF has scored at least 30 points in each of those games. 35 — Number of plays of at least 20 yards Ohio State has allowed this season, which ranks 99th in the country. The Buckeyes are at Purdue, which has 39 plays of at least 20 yards, tied for 19th in FBS. 15-0 — No. 5 LSU’s record when it has a player run for 100 yards under third-year coach Ed Orgeron. Mississippi State allows 3.39 yards per carry, 27th in the country. UAB, in its second season since restoring its football program, is looking for the first 6-1 start in its history when the Blazers host North Texas (6-1, 2-1) on Saturday. First place in Conference USA’s West Division is also on the line. The Blazers (5-1, 3-0) feature one of the country’s best defenses, allowing 283.8 yards per game and 4.6 yards per play. Defensive lineman Jamell Garcia-Williams leads the way with 5½ sacks. North Texas is the defending C-USA West champion and is averaging 479 yards per game behind quarterback Mason Fine. As incredible as it might sound, there has been some speculation this week that Auburn coach Gus Malzahn might be in some trouble with the Tigers off to a 4-3 start. Malzahn signed a $49 million, seven-year contract after last season. Auburn heads to Mississippi on Saturday to face the Rebels, who have an explosive offense and terrible defense. This could be the perfect opportunity for Tigers quarterback Jarrett Stidham to break out of a yearlong slump. Or another reason for Auburn fans to fume about the head coach.